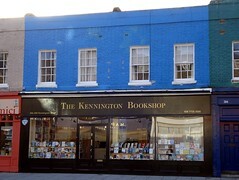 The Kennington Bookshop was a bookshop in Kennington, unsurprisingly. It closed for good on 31 May 2015. They describe themselves as offering "an individual, thoughtful and eclectic selection of books, imaginatively displayed in calm, lovely surroundings." This is actually quite an accurate description. The shop is spacious and books are laid out on tables as well as shelves, to aid browsing. The decor is light wood, the windows are large, and classical music plays in the background. Subject areas covered include travel, food, fiction, poetry, autobiography, and books for children. The travel section is quite large, with plenty of books on England and a good selection of books on London too — not just the generic ones you can find anywhere. The secondhand stock was previously located in the basement, but in early 2015 the secondhand fiction was all brought upstairs and shelved in with the new books. Accessibility: A step to get in. Some of the stock is in the basement, down a flight of stairs. Last visited by Kake, July 2013. Last edited 2016-11-27 14:50:57 (version 9; diff). List all versions. Page last edited 2016-11-27 14:50:57 (version 9).